In LTE, MIB, SIB1, SIB2 is mandated to be transmitted for any cells. Since many of the SIB are transmitted, it should be transmitted in such a way that the location (subframe) where a SIB is transmitted should not be the same subframe where another SIB is transmitted. 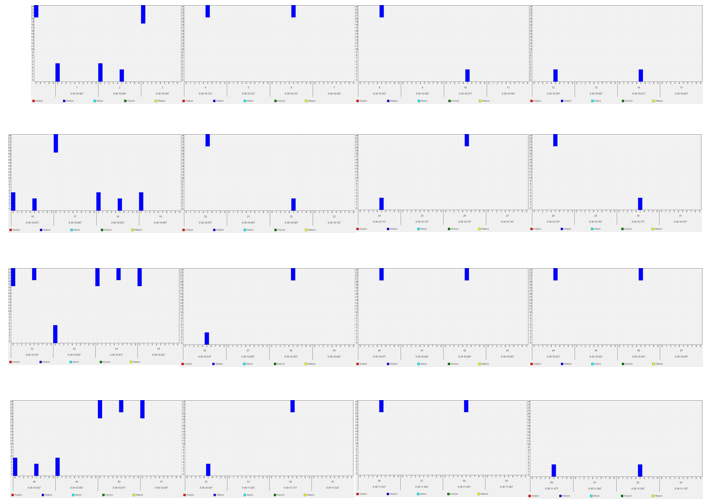 ii) SIB1 is also transmitted at the fixed cycles (every 8 frames starting from SFN 0). You may notice that LTE SIB1 is very similar to WCDMA MIB. Especially at initial test case development, you have to be very careful about item iii). If you set this value incorrectly, all the other SIBs will not be decoded by UE. It means, even though all the SIB is being transmitted UE would be trying to decode them at the wrong timing. And as a result, UE would not recognize the cell and show "No Service" message. The MIB uses a fixed schedule with a periodicity of 40 ms and repetitions made within 40 ms. The first transmission of the MIB is scheduled in subframe #0 of radio frames for which the SFN mod 4 = 0, and repetitions are scheduled in subframe #0 of all other radio frames. Defines the 8 most significant bits of the SFN. As indicated in TS 36.211 [21, 6.6.1], the 2 least significant bits of the SFN are acquired implicitly in the P-BCH decoding, i.e. 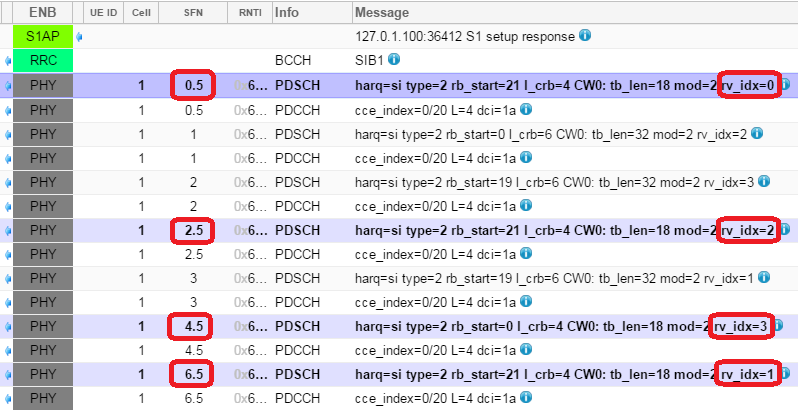 timing of 40ms P-BCH TTI indicates 2 least significant bits(within 40ms P-BCH TTI, the first radio frame: 00, the second radio frame: 01, the third radio frame: 10, the last radio frame: 11). One value applies for all serving cells (the associated functionality is common i.e. not performed independently for each cell). The SystemInformationBlockType1 uses a fixed schedule with a periodicity of 80 ms and repetitions made within 80 ms.The first transmission of SystemInformationBlockType1 is scheduled in subframe #5 of radio frames for which the SFNmod 8 = 0, and repetitions are scheduled in subframe #5 of all other radio frames for which SFN mod 2 = 0. This means that even though SIB1 periodicity is 80 ms, different copies (Redudancy version : RV) of the SIB1 is transmitted every 20ms. Meaning that at L3 you will see the SIB1 every 80 ms, but at PHY layer you will see it every 20ms. For the detailed RV assignment for each transmission, refer to 36.321 section 5.3.1 (the last part of the section). Following log (from Amarisoft) clearly shows the SIB1 transmission as described above. Check SFN.subframe timing and RV index. 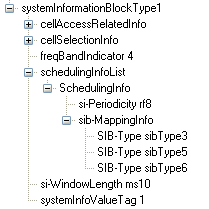 The transmission cycles for other SIBs are determined by schedulingInfoList in SIB1 as shown in the following example (This example is the case where SIB2 and 3 are being transmitted). One thing you would notice that sib-MappingInfo IE in the first node is not specified, but the first entity of schedulingInfoList should always be for SIB2 as specified in the 36.331 as follows (See 36.331 SystemInformationBlockType1 field description). present in the first SystemInformation message listed in the schedulingInfoList list. Understanding overall cycle in the unit of Subframe number is pretty straightforward to understand. But understanding exactly at which subframe a SIB should be transmitted is not that straightforward as you might think. It is related to 'si-WindowLength'. si-WindowLength tells that a SIB should be transmitted somewhere within the window length starting at the SFN specified by si-Periodicity. But this parameter does not specify the exact subframe number for the transmission. The subframe for a specific SIB transmission is determined by a algorithm defined in 36.331 5.2.3 Acquisition of an SI message as follows. radio frames for which SFN mod 2 = 0. Following is SIB transmission shown on Resource Map Display tool of Amarisoft. SIB scheduling in this example is as follows. In this tool, you can easily scroll along time domain to get overall (panoramic) patterns. Following is what I captured multiple images from the RB map and put them in sequence to give you the image of overall SIB transmission pattern. Following is a SIBs captured from a live network. Go through the capture and check if it matches your understanding.